Crust: Combine graham crumbs, sugar and butter; press onto bottoms of 4 parchment paper-lined half sheet pans (or 2 half sheet pans for trial recipe). Cheesecake Batter: Place cream cheese, sugar and vanilla in bowl of mixer fitted with paddle attachment. Beat on medium speed until well blended, stopping occasionally to scrape bottom and side of bowl. Blend in sour cream. Add eggs, 1 at a time, mixing just until blended after each addition. Pour batter evenly onto prepared crusts. 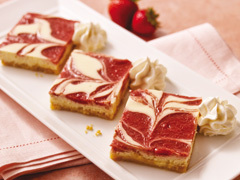 Candy Cane Swirl: Combine all ingredients until loose paste is formed. Spoon 1-1/2 cups (375 mL) mixture into a pastry bag fitted with a plain tip. Insert tip just below surface of cheesecake and swirl mixture into batter while making small circles over the entire surface. Repeat with remaining candy cane mixture and cheesecakes. Bake in 325ºF (160ºC) standard oven 35 to 40 min. 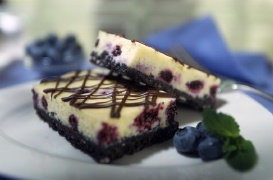 or until cheesecake is set, rotating halfway through baking. Cool completely on cooling racks. Refrigerate several hours or overnight. Cut each pan into 24 squares. 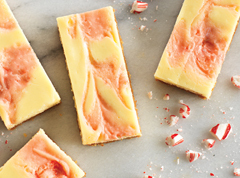 Prepare using peppermint candies if candy canes are not available. 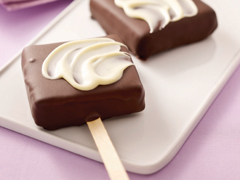 Serve your customers a piece of this rich and indulgent treat to celebrate special occasions. Candy Cane & Chocolate Cheesecake Cloud "Shooters"